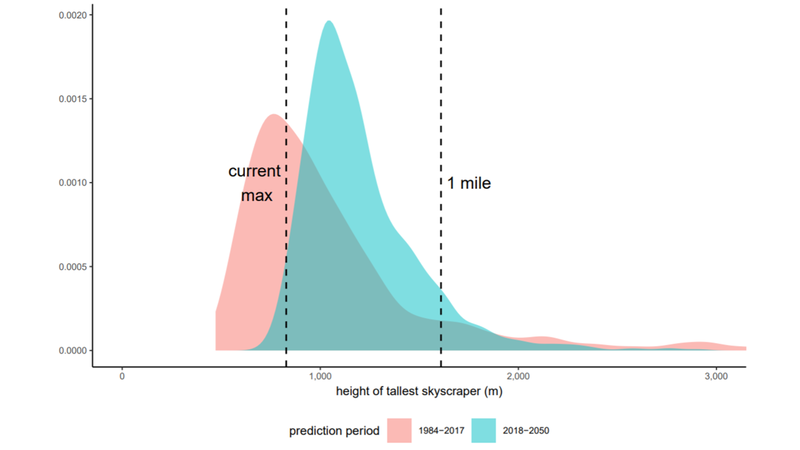 The tallest skyscraper is predicted to be 1134 meters in 2050. There is a 9 percent chance it will exceed one mile. There is a 0 percent chance the current tallest skyscraper will remain the tallest. Future predictions are usually vague. 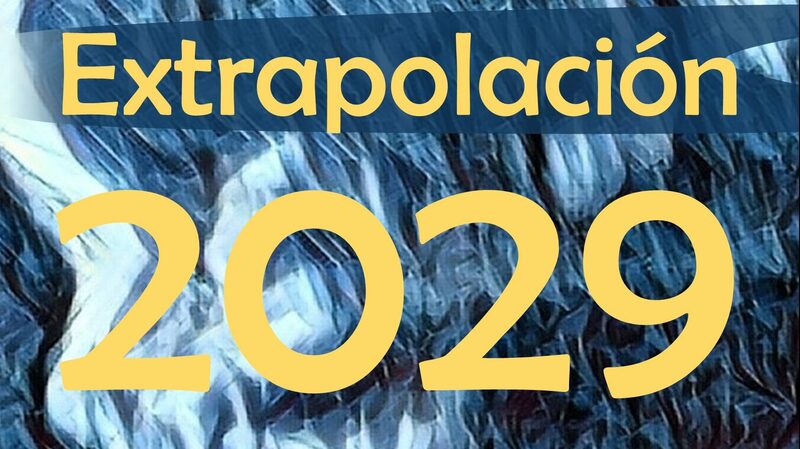 It is not the case with Jonathan Auerbach and Phyllis Wan’s analysis of the expected urban skyline by 2050. They predict(1) the prevalence and nature of skyscrapers in the year 2050 if present trends continue, regarding tall buildings as “random exceedances” over a threshold and using extreme value analysis to characterise their profile. 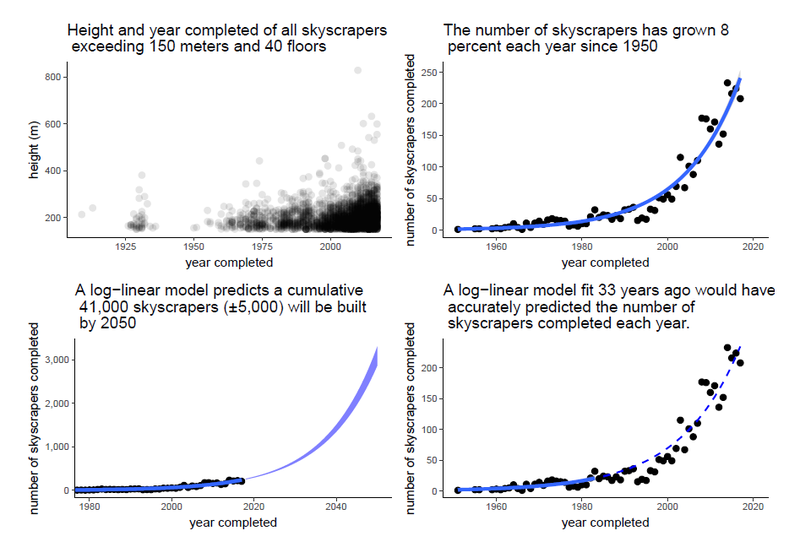 Skyscraper construction has increased at a remarkably steady rate. The number of skyscrapers exceeding 150 meters and 40 floors has risen eight percent each year since 1950. If this trend continues, 41,000 skyscrapers will surpass 150 meters and 40 floors, an increase of 8% a year, far outpacing the expected urban population growth of 2% a year. The probability a new building will exceed the current tallest building, the Burj Khalifa (828 meters), is estimated to be nearly 100 percent. The probability that a new building will exceed the Jeddah Tower (1,000 meters), scheduled to open in 2020, is 77 percent. The probability that a new building will exceed one mile is 9 percent. If a mile-high skyscraper is constructed, we predict it will hold fewer occupants than many mile-highs currently designed. 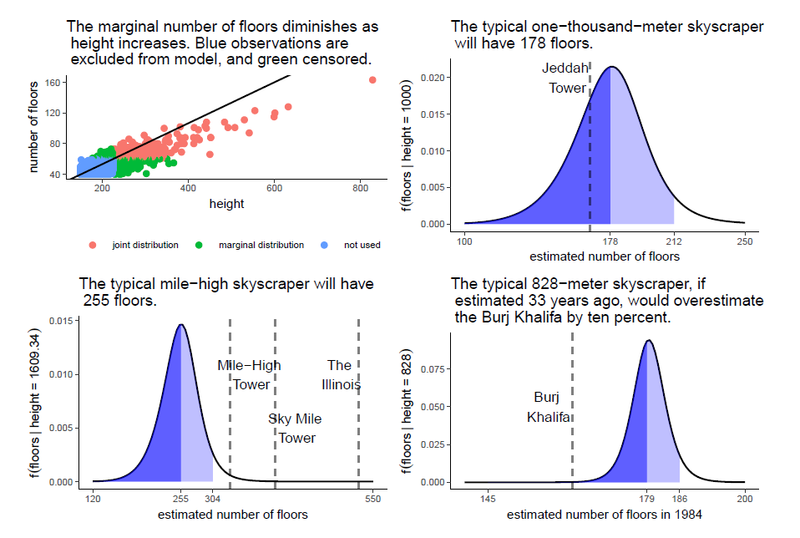 We predict roughly three-quarters the number of floors of the Mile-High Tower, two-thirds of Next Tokyo’s Sky Mile Tower, and half the floors of Frank Lloyd Wright’s The Illinois—three prominent plans of the mile-high skyscraper vision. However, we anticipate the relationship between floor and height will vary considerably across cities. Auerbach, Jonathan, and Phyllis Wan. ‘An Extreme Value Analysis of the Urban Skyline’. ArXiv:1808.01514 [Stat], Aug. 2018. arXiv.org, http://arxiv.org/abs/1808.01514. Previous Upgrading democracy. What are we waiting for? Next You can bet on it!